Names like T.V.R. 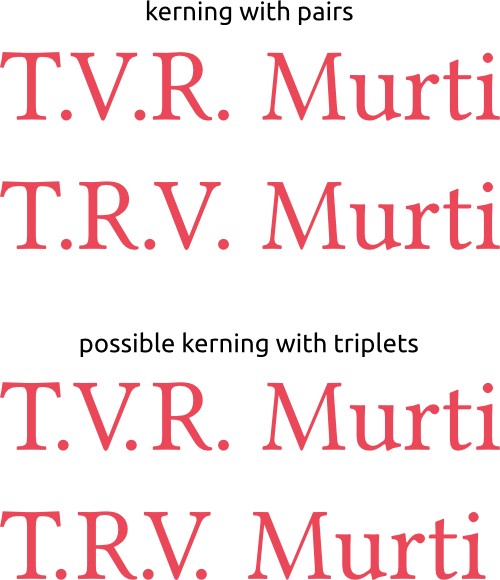 Murti and T.R.V Murti, for example, pose microscopic typographic problems that no binomial kerning table can solve. Fonts with polynomial kerning tables — able to kern a given pair of letters in different ways according to context — have existed for a decade and my someday be the norm. For now, they are a rarity. What exactly is a polynomial kerning table? How is it different from a binomial kerning table or a standard kerning table? What about it or it's implementation makes it polynomial? Polynomial simply means consisting of several terms, as opposed to binomial consisting of only two terms. Contextual kerning is supported by the OpenType format but support in desktop publishing software and various text-processing engines is limited. I don't have any figures to back this up, but—from my experience—contextual kerning isn't something many type designers implement. After the very long and tedious process of kerning character pairs, not many designers will be too worried about contextual kerning. Especially when support is so limited. Note: most of this answer is taken from this previous Q&A . The prefix of nomial refers to the number of glyphs taking into account when determining kerning. Hence a binomial kerning table employs kerning pairs, while a polynomial kerning table considers kerning triplets, quadruplets, and so on. While this choice of words is somewhat justified by the Greek origin of binomial and polynomial meaning consisting of two/multiple parts, I consider it a bad choice as those terms are already taken by mathematics and relevant to type design as such. Usually, the term contextual kerning is used instead of polynomial kerning. As you can see, with pair kerning, things do not look good. For example, there is too much space in V. and R.V. This is likely to avoid overlaps in combinations like V.V. Triplet kerning takes into account which letter is following or preceding the dot and thus it can place the dot closer to the V if appropriate. Moreover, it can harmonise the spacing in all capital–dot–capital combinations. Quadruplet kerning could do things like harmonising the space in R. M and V. M by acknowledging that the V is leaning into the word space while the R is leaning away from it. However, the actual realisation of this in a typesetting program is unlikely, as they usually do not use the space glyph of the font but handle spaces themselves. Not the answer you're looking for? Browse other questions tagged fonts typography terminology kerning or ask your own question.